CHENGDU - Residents in this landlocked city in Southwest China's Sichuan Province will be able to see polar bears and penguins in all seasons of the year. "That is because the Chengdu Haichang Polar Ocean World, which is Southwest China's first ocean park with large polar animals, marine animals and marine life display, started operation on Wednesday," said Deng Gongli, chief of the Chengdu Tourism Bureau. Zhao Wenjing, president of the Haichang Tourism Group Co., Ltd, said that the opening of the Chengdu Haichang Polar Ocean World was a major step in his group's plan to gain access to the Chengdu market and gain more market share nationwide. Based in Dalian, Liaoning Province, Zhao's group built the Chengdu Haichang Polar Ocean World in Huayang Town in the southern suburbs of Chengdu with an investment of nearly 2 billion yuan (US$294 million). It is expected that the Chengdu Haichang Polar Ocean World will receive over 3 million people a year, Zhao said. 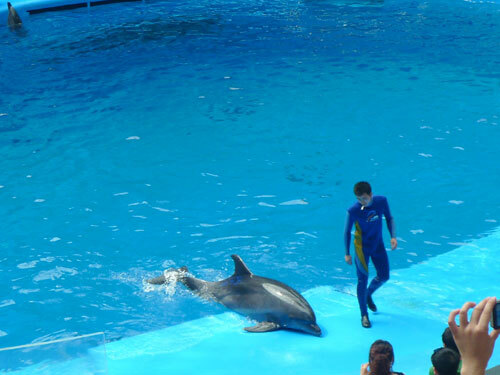 Polar Ocean World consists of the Polar Animal Display Area, Whale and Dolphins Arena, Fun Theater, Marine Animal Display Area and Island Recreation Area. Thanks to artificial sea water, life support systems and the use of high technology, polar animals can live leisurely in inland Chengdu, Zhao said.